Opens store under lifestyle brand Visage. Bandhej opened its first store in Kolkata at Southern Avenue , which is being introduced by Mukta Khanna under her lifestyle brand Visage. Spread over 2,000 sq. ft, the outlet stocks clothes and accessories for men and women. According to Khanna, owner of Visage and incorporator of Bandhej in the city, “Bringing Bandhej to Kolkata made great sense because large population of marwaris (natives of Gujarat) who reside in Kolkata will like to shop from here. Apart from this, Kolkatans are usually very fond of natural fabrics and that is why we are expecting great response from the city." 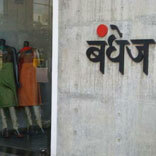 Bandhej now has seven boutiques in Ahmedabad, Mumbai, Delhi, Bengaluru, Kochi, and Kolkata.